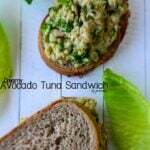 Creamy Avocado Tuna Sandwich is the healthiest and quickest meal you can make! I don’t prefer buying canned foods as a principle, but when it comes to tuna, I don’t have any other choice. We almost always have cans of tuna in the refrigerator and we prepare a quick salad or sandwich using it when we need to prepare a quick and satisfying lunch or dinner. Avocado is a super ingredient for sandwiches and it substitutes wonderfully for mayo. 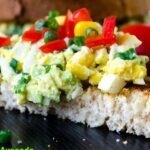 If you love quick sandwiches for meal and looking for healthy versions, you should give this a try! This avocado tuna sandwich is creamy yet there is no high-calorie spreads in it, so it makes a wonderful option for summer lucnhes. You can even prepare these sandwiches beforehand and take them to a picnic by a lake. Wouldn’t it be great? As I love tuna a lot, I combine avocado with it for these sandwiches. You can use leftover chicken or turkey as well. They make equally scrumptious sandwiches. I love the combination of creamy mashed avocado with tuna. I sometimes maket his Avocado with Tuna and serve the salad in avocado shells. This is a perfect treat for dinner parties. These sandwiches have a similar spread with some additions. Avocado is a perfect source for healthy fats and antioxidants, but unfortunately, avocado doesn’t have a place in the kitchen of most Turkish families. Hope people realize the importance and health value of avocado soon and it becomes a regular part of their diet. When I talk to my Turkish friends, I see that they don’t have a single idea about how to eat avocado. Most of them think that it’s one of those tropical fruit and can be eaten as it is just like other fruit they eat as a snack. I will be making wonderful avocado recipes until it becomes popular in Turkey. It would be great if I can help people with my avocado recipes one day. I’m sure if more people start to include avocado in their diet, its price in Turkey will go down! Currently 1 avocado is sold for $2.5 at markets, which is not affordable for most people. If you have leftover avocado tuna sandwich spread, just refrigerate it for the next day and either make another sandwich with it or serve it as a side. The healthiest creamy sandwich with less calories. Scoop the flesh of avocado on a plate. Squeeze lemon on it and mash well with a fork. Add in tuna, parsley, lettuce and salt. Mix with a spoon until everything is very well combined. Drizzle olive oil to give a little brightness. Use whole wheat bread like I did or use your favorite bread and make your sandwich with this mixture. Just made this. I love the simplicity of the recipe! Personally, I’d back off on the lemon, as that’s the dominant flavor. Is the lemon meant to mask the flavor of the tuna? All in all, I’ll definitely make this again with a few tweaks. I’ll try tomorrow morning! Many thanks for the recipe! do you use the juice of one whole lemon or less? i love tuna and avocado. yum! This tuna sandwich is better than any other tuna sandwich that I have ever had.. looks delicious and full of flavour! Definitely need to recreate the recipe, thanks for sharing it!